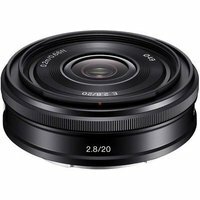 The Sony E20mm f2.8 Pancake Lens is designed to fit Sony's mirrorless APS-C range of cameras with E-mount. This wide-angle, prime lens with a fixed focal length offers a fast aperture of f2.8 lens and is easily transportable covering a host of photographic topics. This compact, travel lens is great for shooting landscapes at dusk and is suitable for gig shots and night photography where a large aperture is required. An easy-grip ring on the lens barrel helps you control whether your subject is sharply in focus or blurred against the background.